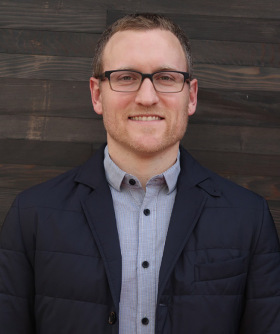 We recently sat down with Michael Hitchcock, the product manager of the Practice Management features within QuickBooks® Online Accountant (QBOA) here at Intuit®. Here are some of the highlights. Q: Michael, tell us about yourself and your background, and what you’re focusing on today. Michael Hitchcock: I began my career as an electronics engineer, where I designed interfaces for consumer electronics. I quickly discovered that the most effective way to delight customers was to quickly build prototypes and get their feedback. That fueled my passion to get my MBA and become a product manager. 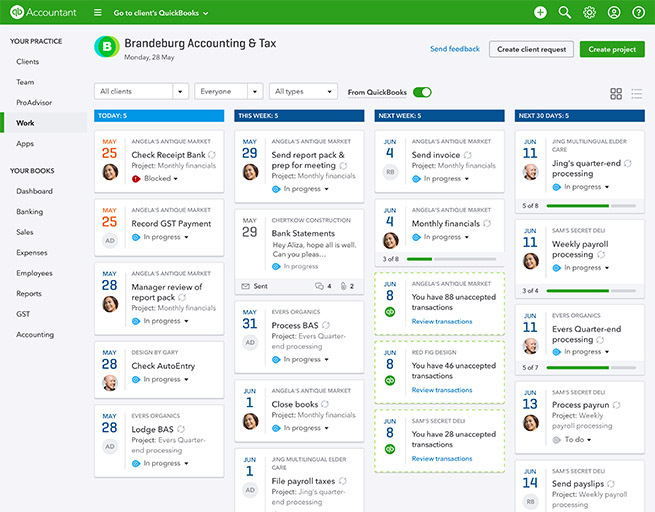 I’ve been with Intuit ever since and have worked on numerous teams on the QuickBooks ecosystem over the past five years, including Payroll, QuickBooks Online (QBO), and now QBOA, where I lead Practice Management. Q: What excites you about working with accountants? MH: The thing that excites me most is knowing that nine out of ten small businesses say they’re more successful when they work with an accountant, so by helping accountants succeed, my teams can help power prosperity for all their clients as well. I also just love partnering with accountants. They’re the most collaborative, open-minded, opinionated, and creative segment of customers I’ve ever served. They make things fun and always keep us on our toes. Finally, I love that this space is changing so dramatically with the proliferation of automation, and that we’re uniquely positioned to help accountants shift how they deliver value for their clients to being a trusted business and technology advisor. Q: You’ve been managing the QBOA Practice Management feature since before its launch in fall 2017. What customer insights sparked the project? MH: The same insights we gained more than a year ago continue to reinforce our vision to create one place for accountants to manage all of their clients and work across all of their services. There are three durable learnings that continue to guide our product strategy: (1) accountants have so many deadlines that they live in constant fear of letting something fall through the cracks, (2) they use numerous tools and processes to manage their clients and track their work, and it takes time to constantly keep these tools up to date, and (3) they’re usually small businesses too, and they need help growing their client base and getting the insights they need to operate more efficiently and scale their practices. Q: What kinds of firms do you think the current functionality is a good fit with today? What are you hearing from them that they like best? MH: Over the past year, we’ve been listening to the feedback of our early adopters and rapidly building capabilities to solve their pain points. As a result, adoption has been accelerating, and we now have well over 10,000 firms who rely on QBOA as their essential tool to manage their practice. This includes everyone from a sole practitioner who wants to manage all his or her tasks to multi-service firms who want to streamline workflows across their teams. The things that resonate most are the time savings, the ease of collaborating with and getting source documents from their clients, and the money we save them by offering this as a free solution. Q: Can you share any interesting stories of customers who have benefited from Practice Management? MH: Our favorite moments are when we get the opportunity to observe and shadow firms at their offices. The biggest surprise to us is that many firms operate similar to how our product teams operate. Some even have a large monitor where they project their firm’s work dashboard in QBOA and have daily “standups” in front of it so each employee can report out on the status of their work and escalate issues that are slowing them down. Q: How does an accountant access the Practice Management feature within QBOA? What is the Practice Management feature within QBOA currently capable of? MH: The Practice Management capabilities we’ve been building can be found throughout QBOA. For example, selecting a client name in the QBOA client list enables you to manage client notes or access the source documents provided by your client. You can also search and provision apps, often with significant discounts, for your firm and your clients through the “Apps” tab. The “Work” tab is where you’ll find the work dashboard, which has two views – a calendar view that shows the work over the next 30 days and a list view that shows all the work the firm has completed or is scheduled far into the future. Q: Could a ProConnect™ Tax Online customer who doesn’t support any QBO clients today still take advantage of QBOA’s Practice Management capabilities? MH: Absolutely! If you’re working on a return in ProConnect Tax Online, you can click “QB Accountant” in the left navigation to be dropped into the “Work” tab. QBOA and ProConnect Tax Online are integrated so that clients in ProConnect Tax Online will automatically show up in QBOA so that accountants can set up their firm’s workflows for all of their clients. Accountants who specialize in tax have told us this provides a really efficient way to manage and do their work. MH: Accountants have told us that they look to Intuit to show them the best and most efficient ways to work. Soon we’ll be releasing workflow templates for tax, accounting, payroll and client onboarding that we sourced from the tip-of-the-spear accountants across the globe. These templates will enable any firm to leverage best practices and standard operating procedures from some of the greatest minds in the space. Q: How does Practice Management fit into the bigger vision for QBOA? MH: Our vision for QBOA is to create one place for accountants to grow and manage all of their clients and their practice. Practice Management is essential to that vision because it creates firm efficiencies that enable accountants to grow their firm and their client base. QBOA’s Find A ProAdvisor platform generates more than 1,000 leads for accountants each day from small businesses, consumers and the self-employed. This is how we help firms grow — by giving them the tools they need to create extra bandwidth, and then giving them an easy way to generate leads and new clients. 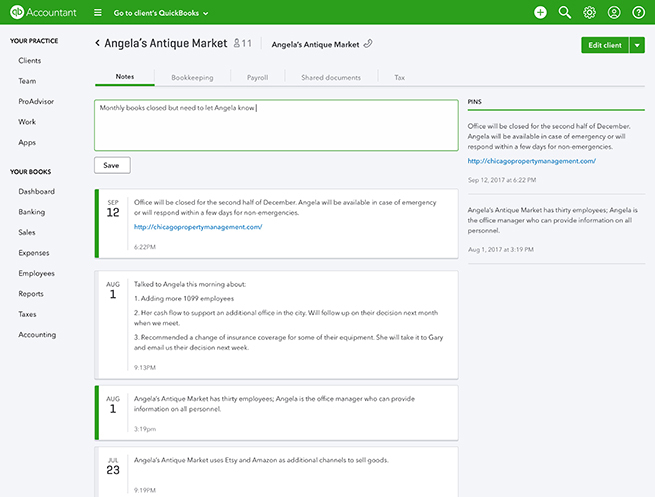 Editor’s note: Find out more about Practice Management, available in QuickBooks Online Accountant.